The complete works of Dr. E. Ross Laughlen's John Line is included in this history. John probably received little or no education. He worked with his Father and on April 22, 1806 he was given the West half of Lot 17, second Concession of Ernestown, Lennox, Ontario, Canada by his Father. This Farm consisted of one hundred Acres. On October 24, 1836 John deeded this Farm to Harriet R. Booth. John was married to Elizabeth Stover of Ernestown, Lennox, Ontario, Canada. It is well to notice that John's sister Hannah Laughlin married Martin Stover who was a brother of Elizabeth Stover. We do not know the date of John's marriage but it was prior to January 1, 1806 at which time his Wife petitioned the Crown for land. Elizabeth Stover was unable to sign her name in 1806. John McLaughlin had a family Bible in which were recorded the names and birth dates of his parents and brothers and sisters. This Bible was in the possession of Mrs. John Franklin Thompson, Empey Hill, in Richmond, near Napanee, Lennox Addington, Ontario, Canada in 1936. 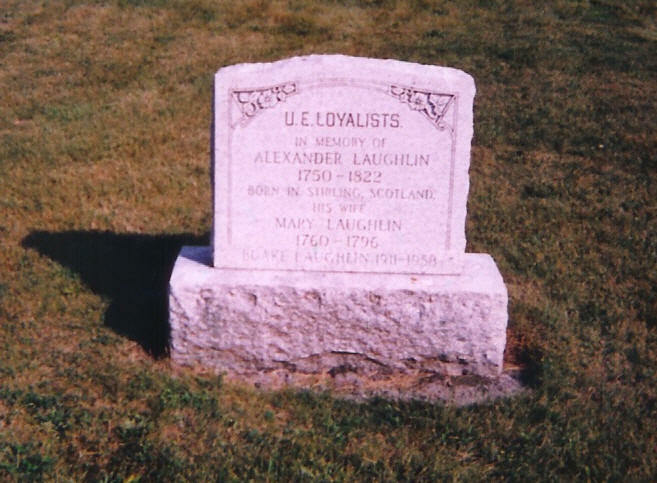 His name was originally Laughlin or Laughlen but after leaving Ernestown, Lennox, Ontario, Canada he adopted the name McLaughlin and all his descendants are known as McLaughlin. John gave part of his Farm for a Cemetery and it is now known as York Burying Ground. This McLaughlin family intermarried in the York families a great deal. John is buried in this York Burying Ground. [S424] The Works of M. E. Laughlin and E. R. Laughlin, 1955 2nd Edition, Mary Elizabeth Bowyer Laughlin and Edgerton Ross Laughlin, Chapter 1, Page 1.